In the early 80’s an effort was made to focus a portion of the FAA’s Airport Improvement (AIP) grant program on the needs of heliport infrastructure through heliport system plans, master plans and design and construction. The FAA had been collecting taxes from helicopter owners and operators for some time without, in the opinion of the rotorcraft manufacturers and operators, investing in the industry. This enhanced attention on heliports came to the immediate attention of Hoyle, Tanner as we were already committed to aviation design and planning and were closely monitoring industry trends. Our Director of Aviation Business Development at that time, knew well that the greatest concentration of commercial helicopter activity was in the south, namely in New Orleans which was a hub for helicopter service to the offshore oil industry. Added to this as an impetus was the fact that the New Orleans Regional Planning Commission also wanted access to the downtown area via helicopter service. The convergence of these interests and the availability of funding came together in the form of a commission for a Downtown Heliport Study, which Hoyle, Tanner was awarded, due in large part to contacts and relationships in the industry. Our study, which was very well received by both City officials and the public, led to another more comprehensive undertaking for Hoyle, Tanner; the Louisiana Statewide Heliport System Study; the first in the nation! We took this success and our newly found reputation as heliport consultants to the western gulf and Houston, Texas. It was there that we completed another heliport study for the City of Houston and soon after embarked upon a project that would lead us another first for Hoyle, Tanner and a 25-year client relationship 1,600 miles away that continues to this day. Next stop was Dallas, Texas for another heliport location plan; followed by Hurst, Texas and then on to Phoenix, Arizona for yet another. Our reputation as experts was by this time unquestioned and we moved still further west. In terms of prestige, you’d be hard pressed to surpass that of our next two clients. First, the Southern California Association of Governments, which is the largest metropolitan planning organization in the county, representing 6 counties and 191 cities in the Los Angeles area, and second, the Port Authority of New York & New Jersey where we were retained to conduct a verti-port study for Manhattan. 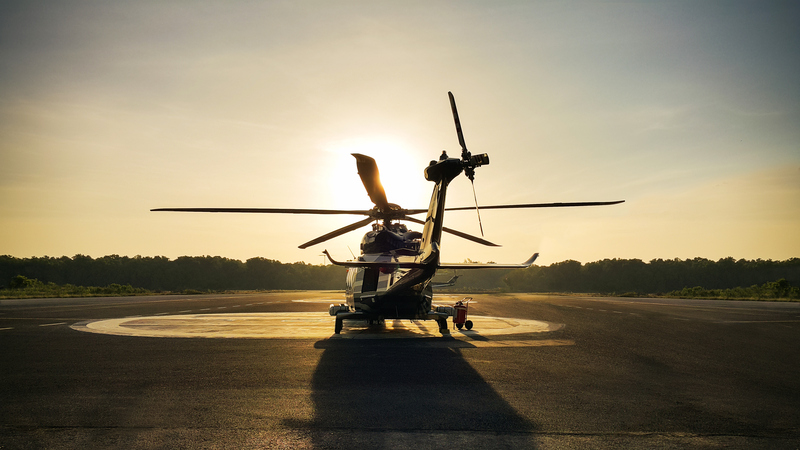 This was the big-time for Hoyle, Tanner, and we had a full-time staff of eight aviation planners supporting our heliport and airport clients. The Hawaiian Islands are also an area that sees intense helicopter activity, driven by tourism and inter-island commercial interests. So when the Hawaiian Department of Transportation sought to plan and develop a facility dedicated solely to helicopter operations on the island of Kauai, Hoyle, Tanner drafted conceptual plans; another first for us. The activities described so far took place over a period of almost seven years. Natural events and changing economic times brought an end to this unique body of work. On September 11, 1992, Hurricane Iniki, the most powerful storm ever to hit the Hawaiian chain, devastated the island of Kauai, putting an end to the need and incentive for that facility. The downturn in the national economy at that time suppressed helicopter activity, lowering the priority of heliport development versus fixed wing airport development. Our string of successes in the heliport sector of aviation had played out, but we made our mark!